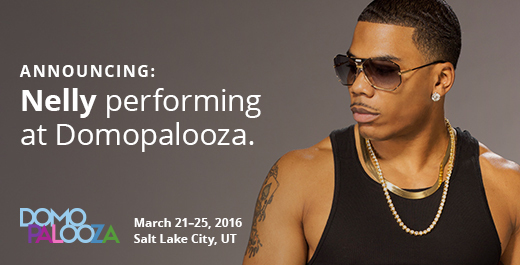 SILICON SLOPES, Utah – February 10, 2016 – Today Domo announced that two-time Grammy Award-winning rapper, singer, songwriter and actor Nelly will perform at Domopalooza™ 2016. Recognized multiple times over the last decade, Nelly has had chart-topping hits in three different genres, with his latest remix “Cruise” winning Billboard’s Top Country Song in 2014. He is also the founder of 4Sho4Kids Foundation, a philanthropic organization raising money and awareness for various children’s health issues. Nelly is the newest addition to Domopalooza’s entertainment lineup, which also features American rapper Flo Rida. Both will perform during Domopalooza’s after hours. Domo also recently announced that NBA champion and entrepreneur Earvin “Magic” Johnson will keynote, sharing lessons on how he leveraged data to grow his business empire. General Stanley McChrystal, best-selling author and former commander of the nation’s premier military counter-terrorism force, Joint Special Operations Command (JSOC), will also keynote, delivering insights on how to use data to lead in a complex world. Domo’s founding team consists of some of the most sought after talent in the industry with experience that includes Amazon, American Express, Ancestry.com, eBay, Endeca, Facebook, Google, LinkedIn, MLB.com, Omniture, salesforce.com, SuccessFactors and SAP. For more information, visit www.domo.com. You can also follow Domo on Twitter,Facebook, LinkedIn, Google+, Instagram and Pinterest.